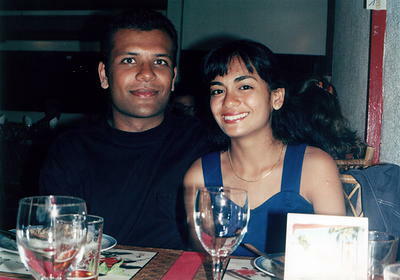 I met Christina at university in 1994 and it was love at first sight. We were both scholarship holders doing our Diplôme d’études universitaires générales (DEUG) in Réunion Island. 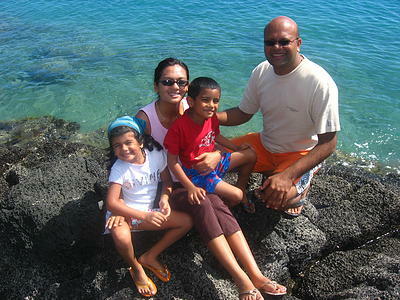 We had truly excellent times in Réunion Island and then France where we went for our Masters level studies. 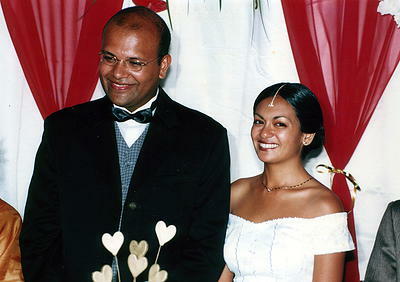 We came back to Mauritius in 1998 (PS: we don’t regret coming back) and started working in January 1999. We worked for one whole year and saved some money. 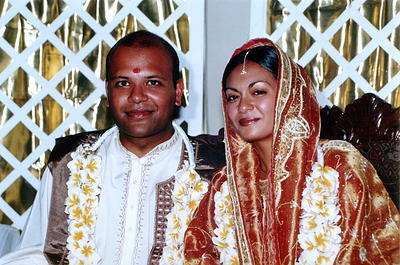 We decided to marry in 2000 and I am proud to say that most of the expenses was born by us. Interestingly, and even if both of us are atheists, we did choose to wed religiously. Our Catholic and Hindu priests were aware of that but both told us “we agree to celebrate your wedding because you both are nice people.” We couldn’t agree more. The general consensus is that the wedding ceremony was very interesting because it involved two priests. In fact, the Catholic priest and the Hindu pandit were alternating and explaining everything they were doing to the audience. Believe it or not but the two above photos are only 1h apart. The party which followed would remain in every guest’s memory. We had an excellent DJ and we had a great time eating, drinking and dancing. We have Hindu, Muslim, Créole and Chinese relatives and we were so happy to see all of them having fun while dancing together the séga, Bhojpuri and Bollywood songs as well as the latest Occidental hits. Happy 10th wedding anniversary, Christina. I love you. Happy Anniversary! I have one question though. Is being married bad for your hair? Being also an atheist and having wed in the Catholic church I fully understand your choice. Great to see strong couples living on in bliss. Happy anniversary to both of you. I have to admit, when I saw the title I was like “Yeah, big deal”, but after reading the post, I must say I am very impressed. I very much understand, and respect, the beauty of having person you come to believe is absolutely perfect..for you. Congrats, and I’ll be looking forward to the 25th Anniversary post. Just one thing. I do not think love happens at first sight. Sure, the person does make a unique, unmistakable and profound effect when you first come across her (or him in other cases), but I think love, the true one comes after having known her (or him) a while, something like mentioned here http://bit.ly/5WBcX5. I met Christina for the first time on 2 September 1994 and it took me a little more than one week to realise that she was the one… Hence my initial use of the word practically. On proofreading, I decided to remove the (practically) because I didn’t want people to focus on what I felt was not the main point of the post. And if you think about it, one week is nothing compared to our life expectancy. and now you are posting your wedding pics … makes the whole idea of aging even more scarier… i feel like stopping time, its going way too fast. Thanks to you all for your nice words. Avec un peu de retard, un très joyeux anniversaire de mariage! Où allez-vous en honeymoon ? En principe, nous allons passer quelques jours à l’hotel dans quelques semaines pour feter dignement ces 10 ans. Though, sorry to mention.. I noticed that the amount of hair is inversely proportional to your anniversary years..